and updates from the OWRB. The OWRB has completed a 20-year update study of the aquifer. Goals of the aquifer study included 1) updating aquifer maps such as saturated thickness, aquifer thickness, and potentiometric surface; 2) compile groundwater use from the aquifer; and 3) incorporating Oklahoma Comprehensive Water Plan projections for management purposes. The Rush Springs aquifer, located primarily in western Oklahoma, is comprised of the Permian-age Rush Springs and Marlow Formations. The Rush Springs Formation is a massive fine-grained poorly cemented sandstone with some interbedded dolomite, gypsum, and shale. The Marlow Formation is composed of interbedded sandstones, siltstones, mudstones, gypsum-anhydrite, and dolomite. Aquifer thickness ranges from less than 200 feet in the south to about 330 feet in northern areas and is generally less than 250 feet thick through the central part of the aquifer. Water from the Rush Springs aquifer tends to be very hard yet suitable for most uses. Levels of dissolved solids are generally less than 500 mg/L. Nitrate, sulfate, and arsenic concentrations exceed drinking water standards in some areas, limiting its use for drinking water. The aquifer is used primarily for irrigation, but it also supplies water for industrial, municipal, and domestic use. Most groundwater withdrawn from the Rush Springs aquifer is in Caddo County. Wells commonly yield 25 to 400 gpm while some irrigation wells are reported to exceed 1,000 gpm. The Cimarron Alluvial and Terrace aquifer located in north-central and north-western Oklahoma is composed of loose sediments, mostly made of gravel, medium to fine sands, and some mud. Underlying the newer geological formations are several older formations including the Flowerpot Shale and Hennessy. The underlying formations do not act as an impermeable unit; however, their aquifer properties are significantly lower and they are not considered part of the Cimarron alluvium and terrace. Aquifer thickness ranges from near zero feet at its boundary to over 100 feet in the central areas with an average of approximately 30 feet. The aquifer is primarily used for irrigation and public water supply purposes, with some oil and gas and domestic water use. Wells commonly yield 50 to 200 gallons per minute (gpm), with some wells reportedly reaching up to 2000 gpm. The higher yield wells tend to be located in the thicker parts of the aquifer. Water quality has been described as adequate for most purposes, but can be hard and variable over short distances; especially if well penetrate the Permian units under the aquifer. Wells that do have less than adequate water can have high concentrations of calcium sulfate or sodium chloride. The Gerty Sand aquifer, located in southeast Oklahoma, is comprised of an unconsolidated Quaternary-age sedimentary deposit unconformably overlying Pennsylvanian and Permian-age formations. The Gerty Sand is primarily fine-grained sand with interbedded silt and clay and a base composed of medium to coarse-grained sand containing larger grains of quartzite, chert, limestone, and granite. The underlying upper Pennsylvanian Ada and Vanoss Formations and the lower Permian Stillwater, Stratford, and Wellington Formations are primarily shale and mudstone with well-indurated arkosic sandstones and limestone conglomerates. These formations largely inhibit the downward flow of groundwater, though limited quantities have been produced locally. The average thickness of the terrace deposit is slightly less than 50 feet and ranges from 10 to 100 feet with the greatest thickness near the central portion of the study area. Total reported use has declined since the 1960s from a high of more than 2,500 acre-feet in 1969 to little more than 500 acre-feet in 2015. The aquifer's primary use was irrigation through the 1990s, which subsequently declined as public water supply use grew. In the past few years reported use between the two has been near equal. Well yield ranges from 5 to 850 gallons per minute. The highest-yielding wells are those completed for irrigation and public water supply. These wells are centrally located where the deposits and saturated thicknesses are greatest. The water is chemically similar across the study area and of good quality, hard, and moderately alkaline due to calcium and sodium-bicarbonate. Total dissolved solids were less than 400 milligrams per liter. Nitrate and Phosphorus were 2.81 and 0.15 milligrams per liter, respectively, and the only metals detected were Barium, Zinc, and Copper with concentrations well below the EPA standard. Other metals, including Arsenic, were not detected. The North Fork of the Red River is an alluvial terrace aquifer consisting of layers of sand, silt, clay and gravel with an average thickness of 40 feet and a maximum thickness of 150 feet overlying Permian age formations (Kent, 1980). The aquifer extends over an area of approximately 575 square miles in Beckham, Greer, Kiowa, and Jackson Counties. It is mainly used for public water supply, irrigation, and domestic supply (Paukstaitis, 1981). Natural recharge to the aquifer occurs primarily as infiltration of precipitation. The sandy soil of the eolian and alluvial deposits has a high infiltration capacity. Burton (1965) estimated a recharge rate between 3.3 and 14 inches per year for the alluvium and terrace deposits in Beckham County, based on comparisons with areas of similar geology and precipitation. Discharge from the aquifer consists of transpiration by plants (where the water table is shallow), withdrawals by wells, and natural discharge to streams. Burton (1965) found that the movement of groundwater in Beckham County is generally northward and eastward toward the river. The North Fork of the Red River is, for the most part, a gaining stream within the study area, meaning that groundwater from the terrace deposits supplies water as base flow to the river most of the year (Paukstaitis, 1981). However, during the summer months, there are often dry sections of the river. The Oklahoma Water Resources Board (OWRB) is working with the U.S. Geological Survey (USGS) to conduct a 20-year update investigating the North Fork of the Red River and developing a new groundwater model. The Boone-Roubidoux aquifer is a freshwater resource spanning eastern Oklahoma. It is a major component of a larger hydrologic system called the Ozark Plateaus aquifer system. The Boone-Roubidoux aquifer is a carbonate aquifer composed of multiple water-bearing units with the Boone and Roubidoux being the predominant formations utilized for fresh groundwater resources. The Mississippian-age Boone Formation crops out in eastern and northeastern Oklahoma and is composed of limestone and cherty limestone, with thicknesses in Oklahoma ranging geographically from 250 feet in Adair County to 400 feet in Ottawa County. The Ordovician-age Roubidoux Formation consists of dolomite, cherty dolomite, and sandstones, which crops out extensively in central and southeastern Missouri with thicknesses in Oklahoma ranging from 100 to 200 feet. The two units are separated by the Chattanooga Shale, also known as the Ozark confining unit, which serves as a barrier for hydraulic flow in some areas but can be absent in others . The Boone-Roubidoux aquifer supplies domestic, industrial, irrigation, and municipal wells, with large-volume wells primarily completed in the Roubidoux Formation yielding on average 200 gallons per minute (gpm), and reaching up to 1,000 gpm in Ottawa County. Boone Formation wells in Delaware County averaged 3.5 gpm with a maximum of 50 gpm, while in Ottawa County Boone Formation wells have reached yields as high as 1,000 gpm. Water quality analyses reveal a wide range in water types produced from the Boone and Roubidoux Formations due to changes in lithology and mineral content. In water produced from the Roubidoux–Boone aquifer dissolved solids concentration generally ranges from 200 to 300 milligrams per liter. Dissolved solids concentrations tend to rise in areas where the Boone and Roubidoux Formations are confined, especially near the western extent of the freshwater portions of the aquifer in counties like Craig and Mayes, and shifting to brine west of Vinita and Pryor, Oklahoma. In these areas groundwater type shifts from calcium bicarbonate to sodium chloride and water from deep wells tends to contain hydrogen sulfide. The Ogallala-Roger Mills aquifer covers approximately 400 square miles in west-central Oklahoma and is part of the High Plains aquifer which underlies portions of 8 states in the central United States. It is primarily located in western Roger Mills County with a small area located in northwestern Beckham County. The aquifer consists of semi-consolidated sediments of the late Tertiary-age Ogallala Formation and unconformably overlies Permian-age Elk City Sandstone, Doxey Shale, and Cloud Chief Formation. It is composed of poorly to moderately cemented layers of tan to white sand, gravel, clay, and silt. The thickness of the aquifer decreases from west to east across the study area. The maximum thickness is about 335 feet but generally ranges from 0-250 feet. Recharge to the aquifer is primarily due to infiltration of precipitation. Other sources of recharge include streams, subsurface inflow, and return irrigation flow. The Ogallala-Roger Mills aquifer provides water for primarily irrigation, livestock, industrial, municipal and domestic purposes with well yields averaging 50 gallons per minute. Public water supply systems that rely on the aquifer include the Red Star Rural Water District and the Town of Reydon. Total dissolved solids concentrations range from about 250 to 1100 mg/L. The chemical composition of the groundwater in the Ogallala ranges from calcium bicarbonate to sodium bicarbonate and is generally considered good for drinking water. The Salt Fork Red River alluvial aquifer is a 291-square mile system of unconsolidated alluvial and terrace deposits in southwestern Oklahoma. Groundwater from that alluvial aquifer and surface water in the river and tributaries of the river are used for irrigation, municipal, industrial, livestock, and self-supplied domestic and industrial water supplies. Groundwater discharge from the Salt Fork Red River alluvial aquifer sustains streamflow in the river during most of the year, and is relied upon to provide water for municipalities and irrigation in southwestern Oklahoma. 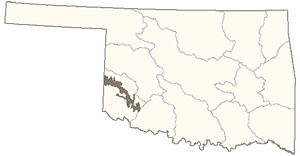 The 1973 Oklahoma Water Law requires the Oklahoma Water Resources Board (OWRB) to conduct hydrogeologic investigations of the State's aquifers (termed "groundwater basins"), to determine the Maximum Annual Yield (MAY) of fresh water that is permitted to be withdrawn from each groundwater basin, and the amount of water that may be withdrawn from each acre of land overlying a basin. A hydrogeologic study has not been made of the Salt Fork Red River alluvial aquifer, and the MAY has not been determined. Until the determination is made, water users are issued a temporary permit for 2 acre-feet/year per acre. Reach 1 of the Washita Alluvium and Terrace aquifer extends from the western Oklahoma-Texas border to Clinton, Oklahoma and is comprised of Quaternary-age alluvium deposited by the Washita River. The alluvium is comprised of fine to medium grained sand with some gravel and interbedded clays derived predominantly from the Ogallala Formation as indicated by the presence of quartzitic material. The composition of the aquifer varies vertically and horizontally as a result of the lenticular nature of these alluvial deposits. The Quaternary age sediments from the Washita River overlie the Tertiary-age Ogallala Formation on the western end of Roger Mills County. The Washita River alluvium overlies the Cloud Chief Formation through most of its length. The Ogallala Formation consists of calcium carbonate cemented sand with gravel, silt, and clay. The Cloud Chief Formation is composed of interbedded sandstones, siltstones, mudstones, gypsum-anhydrite, and dolomite. The lithology of the Cloud Chief Formation limits yields to only a few gallons a day and acts as a confining unit that inhibits the downward movement of groundwater. The 93-mile stretch of Quaternary alluvium and terrace averages one mile wide with 90 to 200 or more feet of saturated thickness. The predominant use of groundwater from this aquifer is agriculture. Nearly half the land in the study area is used for crops such as wheat, cotton, and sorghum, while the other half serves as pasture. Wells in this aquifer typically yield between 200 to 1400 gallons per minute, with an average of 600 gallons per minute. The variation of well yields can be attributed to sharp changes in permeability and saturated thickness due to the varying composition of the alluvium. Water from the Washita Alluvium and Terrace aquifer Reach 1 is relatively high in dissolved solids, averaging around 3,000 parts per million, with the main constituents being bicarbonate hardness and sulfate. The water quality is affected by the underlying Cloud Chief Formation, in which intermittent beds of gypsum and dolomite are present, contributing appreciable water to the alluvium. This site has been redesigned using Cascading Style Sheets (CSS). If you are seeing this message you are using an older browser which lacks support for CSS. Please upgrade your browser to the latest version of Internet Explorer, Netscape or other CSS compatible browser to view this page properly.